Welcome back to our students and faculty as the Spring Term begins. Here’s to sunnier days coming (hopefully) soon! Ah, Spring! More sun, more flowers and more research! 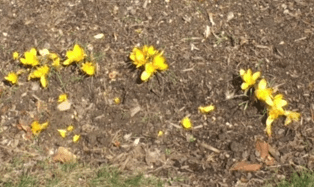 Yellow crocus outside of Clark House. Photograph. 15 March 2016. Dan Rothstein. Interview by Alison Head. Dan Rothstein: The Necessity of Asking Questions. Project Information Literacy, Smart Talk Interview, no. 24. 21 April 2015. Web. 21 March 2016. The library is looking forward to refreshing breezes, melting ice and snow, and of course, spring term research! Welcome back and happy spring term! The library is looking forward to refreshing breezes, daffodils, and of course, spring term research!